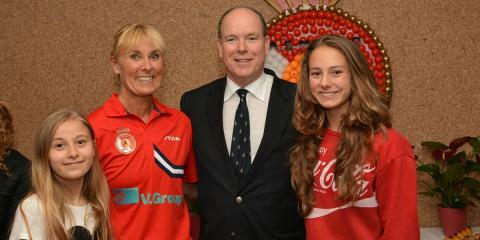 Pictured: Ulrika with Prince Albert of Monaco along with her daughters Vanessa and Samantha at the ASM tennis de table event on 3 June. By day Ulrika Quist is an administration general manager with V.Group’s SeaTec Repairs business based in Monaco. The role takes Ulrika all over the world and she’s never without a paddle when travelling however not the kind you’d expect from someone working in the marine sector. Ulrika’s paddle is for table tennis – a sport she has been perfecting since she was just six years old. Originally from Sweden Ulrika was ranked third in her class as a youth competitor. She played in the top league for a number of years and even though studying in France, traveled home for matches every weekend. As runner up in the US Open in 1986, Ulrika sadly had to hang up her paddle when she went on board but was quick to pick it back up again when she came ashore in 1999. Now playing for the ASM Monaco Tennis de Table club, Ulrika together with her team mates has received sponsorship from V.Group’s local Monaco office for club shirts to play in the league events.